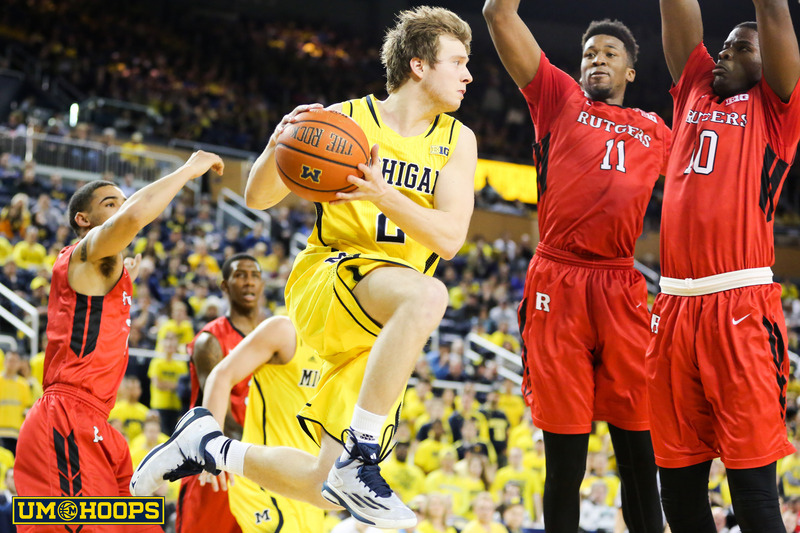 Ricky Doyle won’t forget his first meeting with John Beilein anytime soon. The center had twisted his ankle near the end of an open gym session that Beilein was attending. When Doyle sat down to speak with the coach afterward, Beilein suggested the recruit rest his leg on him to help with icing the injury. The experience was part of what moved Doyle to commit to Michigan in March of 2013. And just a year and a half later, as a true freshman with raw but undeveloped talent, he’s vying to start at the five for a team with NCAA tournament expectations. Though the Wolverines don’t return anyone who started at center last season, Doyle faces significant competition at the position. There’s Max Bielfeldt, Michigan’s only frontcourt option to have played in a Division I game, and Mark Donnal, who impressed in practices last season despite being redshirted. Even DJ Wilson, another true freshman, is versatile enough to see time at the five. But Doyle is a true back-to-the-basket threat unlike anyone Beilein has had at Michigan, prompting assistant coach Bacari Alexander to say last month that the center will be “bringing the thunder” on the court. The competition to start has been especially fierce with Donnal, “the lightning,” whose game differs in that he’s a better shooter and can operate effectively in the pick-and-roll. “Thunder and lightning? Mark’s a great shooter,” Doyle said. “I guess I’m the one with the bang, he’s the one with the strike. But concerns remain regarding Doyle’s fitness and mechanics. And while he averaged double-digit rebounds in Michigan’s last three games during its summer trip to Italy, he didn’t grab a single board in the Wolverines’ first contest — against perhaps the team’s weakest opponent. Alexander worked with him in Italy to correct basic mechanics, but Beilein said Thursday that footwork remains a major focus with both Doyle and Donnal. No one is expecting double-double production from Doyle every night, but Michigan is going to need something from its freshman big. In the mean time, Beilein and big man coach Bacari Alexander will take things day-by-day and practice-by-practice to try to prepare Doyle for the challenges ahead.